Many Canadians know that Viola Desmond is the first Black, non-royal woman to be featured on Canadian currency. But fewer know the details of Viola Desmond’s life and legacy. In 1946, Desmond was arrested for refusing to give up her seat in a whites-only section of a movie theatre in New Glasgow, Nova Scotia. Her singular act of courage was a catalyst in the struggle for racial equality that eventually ended segregation in Nova Scotia. Authors Graham Reynolds and Wanda Robson (Viola’s sister) look beyond the theatre incident and provide new insights into her life. They detail not only her act of courage in resisting the practice of racial segregation in Canada, but also her extraordinary achievement as a pioneer African Canadian businesswoman. 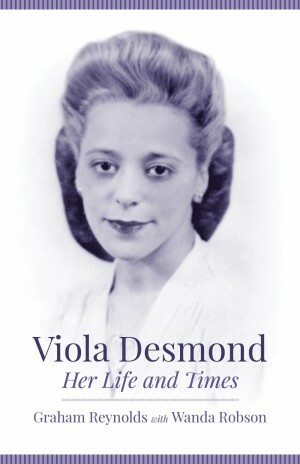 In spite of the widespread racial barriers that existed in Canada during most of the twentieth century, Viola Desmond became the pre-eminent Black beauty culturist in Canada, establishing the first Black beauty studio in Halifax and the Desmond School of Beauty Culture. She also created her own line of beauty products.